column. The base surge billows upward to a height of several hundred feet and expands rapidly outward to a distance of several thousand yards. Then it gradually rises from the surface and merges with the cloud formed by the escaping fireball. 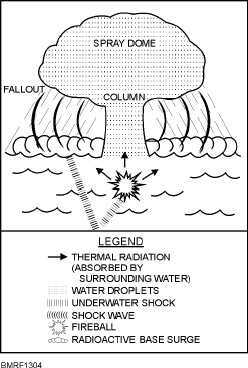 EFFECTS OF NUCLEAR WEAPONS Detonation of the nuclear bomb creates a blast wave that travels outward in all directions at an initial speed much greater than the speed of sound. When the wave strikes the earths surface, another wave is formed by reflection. At some distance from ground zero (depending on the height of the blast), the primary and reflected waves combine to form a reinforced blast wave. Pressure at the wave front, called overpressure, is many times that of normal atmospheric pressure and is what causes most of the physical damage. Additionally, underwater bursts create large water waves, some of which reach heights of over 90 feet within a few hundred feet from the blast. The water waves travel outward at high speed for a distance of several miles, gradually diminishing in size. The overpressure decreases as the distance from the blast increases, but it can cause damage many miles from the blast. Nuclear weapons produce explosions of great force and heat and release nuclear radiation. Their primary purpose is the mass destruction of property and personnel. Their effects are divided into three categoriesblast waves or shock waves, incendiary, and radiation. Blast Waves or Shock Waves Injuries caused by blast waves can be divided into primary (direct) injuries and secondary (indirect) injuries. PRIMARY BLAST INJURIES.Primary blast injuries result from the direct action of the air shock wave on the human body. The greater the weapons size, the greater the blast waves effective range, with a subsequent increase in casualties. SECONDARY BLAST INJURIES.Secondary blast injuries are caused by strong blast winds reaching hundreds of miles per hour collapsing buildings and timber and flinging debris about. Personnel may also be hurled against stationary objects or thrown to the ground by high winds accompanying the explosion. At sea, the shock wave accompanying an underwater burst produces various secondary injuries. Causalities resemble those caused by more conventional underwater weapons, such as mines and depth charges. Instead of being localized, the casualties extend over the entire ship. Also, injuries result from personnel being thrown against fixed objects or structures. Unsecured objects can act as missiles and cause many injuries. Incendiary There are two general ways fires can originate in a nuclear explosion. 1. First, kindling fuels can be ignited as a direct result of the absorption of thermal radiation. 2. Second, fires can be started from electrical short circuits, broken gas lines, or other interrupted heat sources as an indirect effect of the blast wave. 13-10 Student Notes: Figure 13-4.A subsurface burst.